Born in the Bronx, NY, Bob grew up in Rockaway Beach. He played high school basketball at Xavier High School in Manhattan. After playing a year at Oneonta State University, he caught the coaching disease at Oneonta High school. Upon graduation Bob accepted a position at Tolentine High School. He was the JV Coach and Assistant Varsity Coach under John Sarandrea. Directing the schools new computer lab while also coaching Volleyball, Baseball and Softball. In 1988 Tolentine captured the mythical U.S.A. Today National Championship behind the play of the late St. John’s star Malik Sealy. 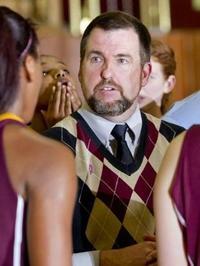 Bob Mackey became the youngest head coach in the CHSAA the following season at 24. In 1991, after the tragic closing of Tolentine High School, Bob accepted a position at Christ the King High School. For the next nine years he was Vincent Cannizzaro’s assistant. State Championships followed in each of the following years. National Championships in 1993 and 1998. With players like Chamique Holdsclaw, Kristeena Alexander, and Sue Bird joining the ranks of the NCAA. The new millennium saw Bob Mackey move into the Head Coaches seat at Christ the King. Following a 25-5 season with a record 11th consecutive state title. The 2002-03 season looked very promising with 7 Seniors signing Division I scholarship letters. Among them, Shay Doron (Maryland) would go on to play in the McDonalds All-American Game. After winning the Nike Tournament of Champions, Bob Mackey’s team finished the season 25-2 with their 19th consecutive N.Y.State Catholic Championship. He topped 100 wins in 4 years as head coach but more importantly saw great group of players move on to the next level. The 2003-04 season brought a whole new line-up for the Lady Royals. Not one player had ever started a Varsity Game. The team made it back to the finals of the Nike Tournament of Champions but lost to a veteran Bishop McNamara team 57-48. The 2004-05 season returned Christ the King to the finals of the ToC. Led by Duke signee Carrem Gay and underclassmen Tina Charles, Christ the King defeated Piedmont 44-42 in the finals. Christ the King. The Lady Royals finished the year a perfect 27-0 and New York State Federation Champions. USA Today selected the as the number one team in the country asd Bob Mackey as the High School coach of the Year. The Women’s Basketball Coaches Association also choose Coach Mackey, National Coach of the Year and selected him to coach the All-American game at the Women’s Final Four. The 2005-06 Royals continued their winning ways finishing a perfect 30-0. Mackey was again named National High School Coach of the Year for 2006. Mackey still spends his summers as a director at the prestigious Eastern Invitational Camp. He is the Associate Athletic Director at Christ the King. Bob Mackey is married with a 13 year old daughter. He resides in Smithtown N.Y. where he coaches CYO Basketball at St Patrick's and Travel Soccer for the Village of the Branch Soccer Club.